Even bullish Apple analysts have surprisingly modest estimates for iPhone sales growth this year. Apple (NASDAQ:AAPL) stock initially had a muted reaction to the company's strong earnings report and guidance issued on Oct. 20. The stock has surged about 15% in the past month, though, reaching a series of new record highs. Apple stock's rise has been propelled by rising expectations for iPhone 6 and iPhone 6 Plus sales among Wall Street analysts. Almost every day, another investment bank research team increases its Apple stock price target, pointing to strong sales of both new iPhone models. Some people fear that Wall Street's rapidly rising expectations will lead to an "overhyped" stock and eventually give way to another crash. However, most Wall Street analysts still seem to be underestimating the amount of iPhone unit sales growth that Apple can achieve in the coming year. One sign of the strong demand for the iPhone 6 and iPhone 6 Plus is that both models remain in short supply more than two months after their initial on-sale date. This week, the lead time for the iPhone 6 with 16GB of storage dropped to three-five days at Apple's U.S. online store. However, the 64GB and 128GB models are still displaying a seven-10 day wait. Wait-times for the iPhone 6 Plus are even longer, at seven-10 days for the 16GB models and at least two-three weeks for higher-memory configurations. Last year, Apple was much closer to reaching a supply and demand balance by this time. The iPhone 5c was readily available from very early on, and all variants of the iPhone 5s were down to a three-five day wait by mid-November. Despite the tight supply, user adoption of the iPhone 6 and iPhone 6 Plus is running well ahead of the adoption pace of the iPhone 5x and iPhone 5c last year. This is another sign of how strong demand is. According to Fiksu -- which tracks iPhone usage by model -- the iPhone 6's share of total iPhone usage is about three percentage points ahead of the iPhone 5s usage share at this time last year. Meanwhile, iPhone 6 Plus usage is about 0.5 percentage points ahead of where the iPhone 5c was tracking at this time last year. Additionally, adoption of the new iPhones is accelerating, which implies that Apple has managed to increase its build rate. Over the last three weeks, the combined usage share of the iPhone 6 and iPhone 6 Plus has been rising by about 1.3 percentage points each week, compared to an average weekly gain of one percentage point in the four weeks before that. If this trend continues, the new iPhones will account for about 20% of all iPhone usage by the last week of December. For comparison, last year, the combined usage share of the iPhone 5s and iPhone 5c in the last week of December was 15.8%. Additionally, Apple sold 169 million iPhones last year, and many of those went to first-time iPhone buyers. As a result, the iPhone user base is significantly larger than it was last year: perhaps 15%-20% larger. Therefore, each point of usage share represents more iPhones today than it did at this time last year. To sum up, Apple's new iPhones have a higher usage share than the iPhone 5s and iPhone 5c did at this time last year. That's despite the growth in the iPhone user base and the greater supply constraints this year. Thus far, Apple's iPhone unit sales to end users in this product cycle may be running 40% ahead of last year's pace. 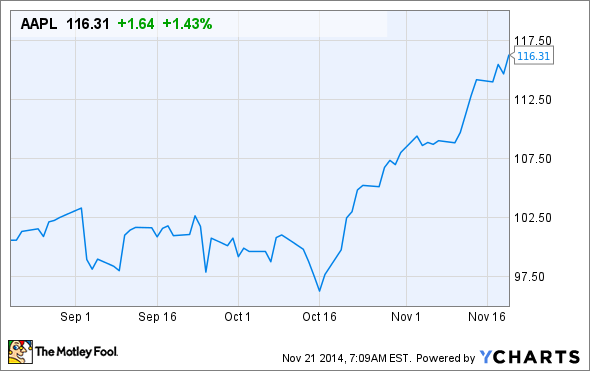 Walter Piecyk of BTIG increased his Apple price target to $135 this week. Even after increasing his iPhone estimates, he is only expecting Apple to sell 62.5 million iPhones this quarter and 48 million next quarter, representing year-over-year growth of 22.5% and 9.8%, respectively. Andrew Uerkwitz of Oppenheimer also raised his Apple price target this week. He increased his full-year iPhone unit sales growth estimate from 9.3% to 17%, leading to a new price target of $130, more than 10% above Apple's recent stock price. Other analysts' fiscal year 2015 iPhone unit sales estimates have clustered around 200 million, which would represent 18% year-over-year growth. This would certainly be very respectable, but it's not that much better than the 13% iPhone unit sales growth Apple achieved with the iPhone 5s last year. Lots of Apple analysts like to talk about a "super-cycle" of upgrades and user base growth occurring this year. However, their estimates don't really line up with their words. Even bullish analysts are (for the most part) predicting a very modest uptick in iPhone unit sales growth. The rapid adoption of the iPhone 6 and iPhone 6 Plus suggests that analysts' descriptions may be more accurate than their formal estimates. Furthermore, the holiday shopping season is about to start and iPhone supply remains tight. This suggests that Apple won't reach a supply demand balance this quarter, pushing more sales into the March quarter. If that's true, the cycle of analysts raising their iPhone sales estimates, earnings estimates, and Apple price targets could continue for months. That should provide a nice tailwind for Apple stock to reach a valuation more in line with its strong long-term prospects.